Google's new Pixel 2 smartphoned doesn't exactly aim to stand out from the crowd. The design is unassuming and, compared to other recent smartphones, very last generation. The screen has bulky bezels that most smartphones have abandoned for edge-to-edge screens. The aluminum body is textured rather than sleek, and the sides of the phone are squared off rather than smooth curves. But these aren't bad things: with the Pixel 2, Google is focusing on substance over style to create a new smartphone that isn't just a new smartphone. The textured back and squared-off edges make the phone easier to grip and less prone to getting smudged with fingerprints. The bezels house the phone's powerful speakers and make it easier to hold without accidentally tapping the screen, too. It doesn't look quite like what Apple and Samsung tell you a top of the line smartphone should look like, but you may enjoy the Pixel 2 all the more for it. As to the stats, the Pixel 2 and its larger Pixel 2 XL cousin keep up with the competition: both smartphones run Android 8.0 and are powered by a Snapdragon 835 processor and 4GB of RAM, with a vibrant OLED display, a 12MP rear camera (which Google claims is the best camera on any smartphone) and an 8MP front-facing camera. Following the design of Apple's recent iPhones, the Pixel 2 doesn't have a headphone jack, which is likely to frustrate some, but a growing number of USB C headphone options — as well as plenty of wireless headphones like Google's new Pixel Buds, which are capable of real-time translation — may ease the pain. 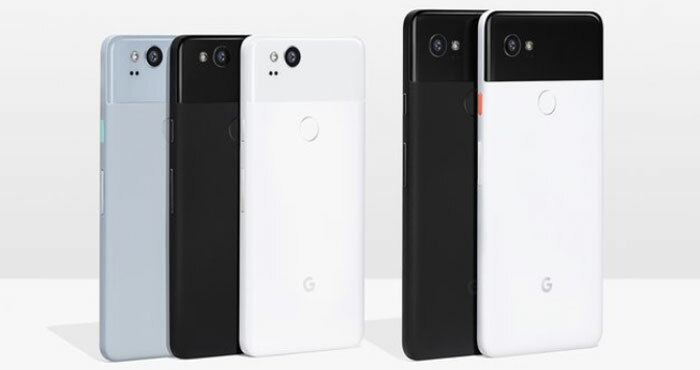 Beyond those base specs, the difference in the two phones is screen and battery size: the Pixel 2 has a 5-inch screen and a 2700mAh battery while the Pixel 2 XL has a 6-inch screen and a 3520mAh battery. Both phones. should offer all-day battery life, but as with all phones that will depend on how you use them. However, a quick, 15-minute charge will give it an extra 7 hours of battery life, so it will be easy to juice up if you ever run low. The most impressive part of the Pixel 2, however, isn't the stats: it's the smarts. Search is what Google is really good at, and it's integrated a lot of cool features into the Pixel 2 that will definitely impress. These are the first phones to support Google Lens, which lets you point your phone at anything‚ from landmarks to business cards — and let Google identify it or catalog it for you. At present, it can only identify a few things (landmarks, books, music albums, posters, and business cards), but Google says the feature will keep getting smarter. Google Assistant is getting smarter, too, with new routines that let you automate multiple tasks: for example, you could tell your phone "good night" to have it set your alarm, silence your phone, and dim the smart lights in your bedroom. It will be able to make purchases from select services like 1-800-Flowers and Ticketmaster. A handy new broadcast feature can send messages to the whole family — like "it's time for dinner" — without you lifting a finger. These, and all of the Assistant's other features can be accessed by saying "OK Google" or squeezing the edges of the phone. The Pixel 2 (starting at $649) and Pixel 2 XL (starting at $849) will both available for pre-order right now and start shipping on October 19 — but beware, because certain models are already starting to sell out. You had a great article on the effects, bad and good, of video game addition. It came with an an Oct 6 email about the Google Pixel phone. It’s not indexed anywhere, and I’ve been search for about an hour. Could you direct me to it? Do you recall what is was about? We haven’t written a recent article about video game addiction. Do you recall more specifically what it was about? That will help me track down where you might have seen it.